Anyone that knows Carson knows that he is not a lover of shoes. Unless they are his sister's. 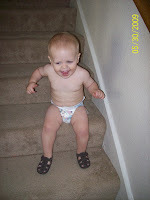 Of course, he is fascinated with Josie's shoes. Which she obligingly leaves all over the house. This morning he repeatedly brought me one of her pink flip-flops. I couldn't figure out what he wanted until he threw it at his foot. Then I realized that he wanted me to put it on him. I tried to talk him out of it. It isn't that I care if he tries to wear them but he had on footed pajamas! He was insistent. I put the shoe on. Sure enough, he took two steps before it fell off. Back to me so I could put it on again. Needless to say, with a 1 year-old, we repeated this scene about 4 times. I tried to persuade him that they weren't his size, not his color, and he doesn't like shoes anyway! Finally, after he would not give up, I took off his pajamas. We put on both shoes and still, no success. He couldn't walk. I am sure that in his little mind, those flip-flops looked pretty exciting. They are hot pink, they are easy to put on and the biggest plus: they belong to Josie and anything that is her's is instantly attractive. I couldn't explain to him that they weren't meant for him, he just knew that he wanted what belonged to his sister. I got out his shoes. No go, not what he wanted. His own shoes are adorable. They fit his chubby little feet and he can walk in them.But, they are his. He only wanted what wasn't his. He only wanted what belonged to somebody else. It didn't matter that they weren't meant for him, that they would never be the same on him as they are on Josie. He didn't even care that his Dad would be appalled by his fascination with hot pink footwear. He just knew he wanted them. Since I am getting to be known for finding spiritual correlations in the strangest things it shouldn't surprise anyone that I started thinking about all the times I feel that way. All the times that I have wanted someone else's pink flip-flops and pouted when they didn't look as good on me. Or, I couldn't afford them. Or, they didn't fit my feet. Like when I wish my husband had someone else's job. Or I had their clothes. Or their abilities. Those aren't my flip-flops! It would be like me trying to wear skinny jeans- ha! Sometimes I just need to appreciate how great their flip-flops look on them. I have my own shoes, and if I let them they look just as good on me. Maybe if I took better care of my flip-flops, they'd be more comfortable on the days I don't feel like wearing them. Good message, Friend! Clare! A devotion on Flip Flops! Were you thinking of me the whole time:) I loved the correlation and know I do that SO often. I am going to try to be more happy with my own footwear (which just happens to be flip flops 90% of the time;). Very true! I cracked up about Carson...he truly wants to be able to do all that Josie does. Very nice lesson indeed. I think I waste so much time wishing I had what others have--thanks for the reminder, they're not my flip-flops! Imitation is the highest form of flattery. Carson's learning early :) I cannot wait to see those little things this summer......soooo cute!